When constructing a solid house, you must first frame it with strong timber and beams. Likewise, if you want to have a strong body, you must make sure that its supporting structure is built with the finest materials, and that the structure is properly nourished and protected. Today’s modern lifestyle frequently embraces dietary habits that actually deplete the body of the calcium it needs. Most people do not consume enough fruits, vegetables and dairy products to maintain proper bone health. As a result, calcium can be pulled from the bones to maintain the body’s proper calcium-phosphorus balance. 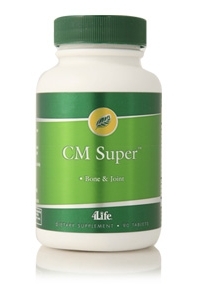 CM Super provides your body with a comprehensive formula to support both bone metabolism and the structural system. CM Super contains several forms of calcium and magnesium, patented chelated minerals and other support nutrients to fortify your body with the strength and support it needs. CM Super contains nutritionally meaningful levels of calcium and vitamin D for skeletal support that exceeds many other products. This product offers varied sources of calcium to maximize overall benefits. Optimal nutrient absorption is further ensured with the added benefits of magnesium and chelated minerals. "I was struck by an automobile, in a glancing blow to the door. My rib cage was compressed and the greater trochanter of the left femur was cracked. I took Transfer Factor®, CM Super, ARC™, Choice 50, Fibro AMJ Day-Time™, Fibro AMJ Night-Time™ and FemRite®. Within two weeks I no longer used a walker and I was doing things around the house. I am delighted."